Traditional doors were once merely home passageways intended for security, privacy and heat preservation. Today’s designers go beyond functionality and incorporate antique doors throughout interiors, even in furnishings and as wall décor. Use the following tips to find and feature reclaimed wood doors at home. Search architectural salvage shops for inexpensive antique doors. Some resale stores occasionally carry vintage home materials, including doors and windows. For free pieces, try asking the neighbors. Homes undergoing extensive renovations might dispose of old doors with faulty hinges or cracks. Keep an eye out for large garbage bins and remodeling trucks to spot potential goldmines, and ask to rummage through discarded materials if necessary. As any dumpster-diving do-it-yourself enthusiast says, have no shame when it comes to scoring home improvement materials for free. Owners should consider using doors as building blocks for new furniture and décor pieces, similar to using reclaimed wood or any organic, upcyclable material. For instance, use old doors as frames for full-length mirrors. Find inexpensive mirrors at thrift stores and discount home goods retailers. Remove backing and cut mirrors with a glass cutter before gluing glass in place with mastic. A $5 mirror looks polished when featured on top of unique, architectural staples. Environment-friendly homeowners can use doors as green alternatives to purchasing new lumber for their home improvement projects. Keeping organized is one of the most important parts of having a well-designed home. Otherwise, interiors look haphazard and sloppy, and clutter detracts from even the most aesthetically-pleasing features. When it comes time to move, lack of storage can be a red flag to buyers looking at homes for sale. House hunters won’t notice a Carrera marble countertop if magazines, letters and kitchen goods are scattered across the top. Frame reclaimed wood doors together to create a trunk for small goods including extra papers and minor kitchen appliances. Top with cushions to create extra seating in a pinch. Doors also make great backdrops for bookcases. Simply anchor doors to walls and add shelves to the front for stress-free showcase pieces. From headboards to wall coverings, vintage doors act as décor elements in any home. Depending on the desired look, homeowners might want to sand and paint their reclaimed doors. To create more traditional, upscale décor pieces, sand down imperfections and paint wood in neutral shades that match classic color palettes. For a shabby-chic or country cottage appeal, leave doors in their natural, weathered states. Either attach to bedframes like traditional headboards, or hang on walls behind box springs. Alternatively, reinstall doors in working condition in entryways. Although mostly practical, replacing doors also adds character to an otherwise blank slate. Apart from the aforementioned projects, place antique doors in rooms lacking personality and charm. 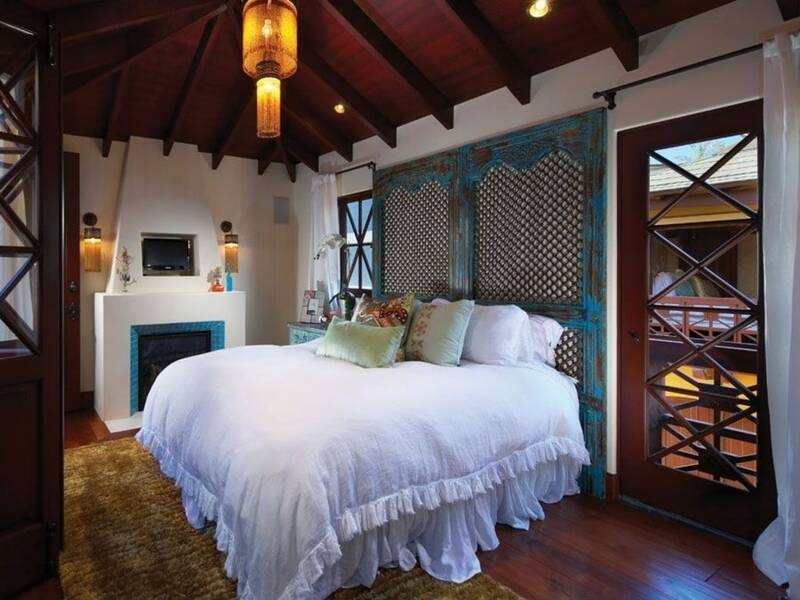 Love the idea of vintage doors behind a bed. I’ve been trying to decide on a headboard for a year and after seeing this article, decision made!! Hi Lisa! I made a headboard, but I REALLY want one of these. They really create a neat focal point.